“Mama, don’t take my Polaroid away.” (Or, in this case, my Fuji Instax instant camera and the Paul Simon song actually says Kodachrome.) Weddings are comprised of moments both large and small, serious and silly, and I absolutely love this double shot that combines a sweet kiss in the background with light-hearted candid shots in the couple’s outstretched hands. It perfectly captures love and laughter with a bright focus on the latter and also showcases their beautiful wedding rings. Detroit, Michigan was host to this celebration and wedding photograph that was taken in the Rivertown District after snapping some silly keepsakes of the couple. 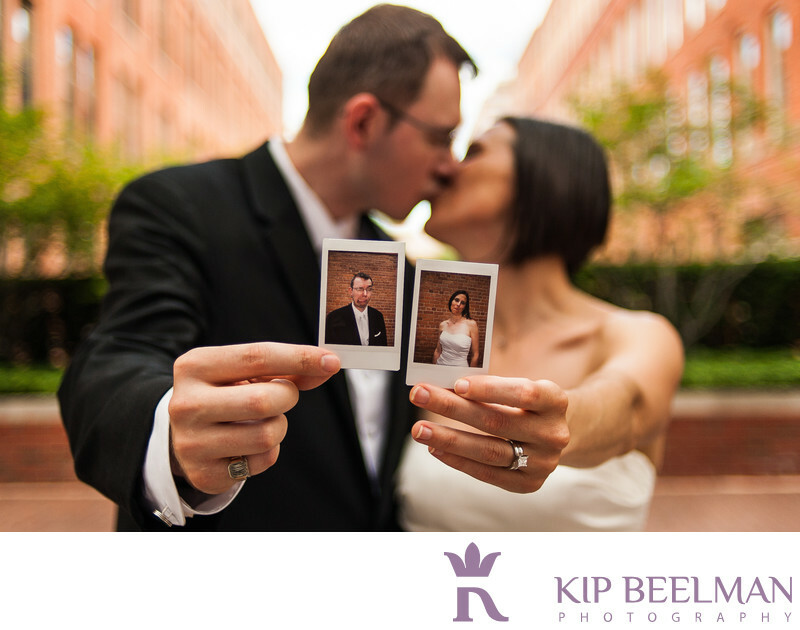 Many couples enjoy the blend of fancy scrapbook photography and instant fun photos for their wedding photography experience, and I enjoy capturing a full variety of moments, looks and sensations throughout the day. Their portraits were taken around the hotel, across the Detroit River at beautiful Belle Isle Park, and in the aforementioned loft and warehouse Rivertown District surrounding the hotel in combining urban with nature and loving with joking. Keeping with that theme, the couple was married in a beautiful waterfront ceremony on the Detroit River. Location: 1000 River Pl Dr, Detroit, MI 48207. Keywords: Detroit (3), Hotel Wedding (48), Riverwalk Hotel (3).